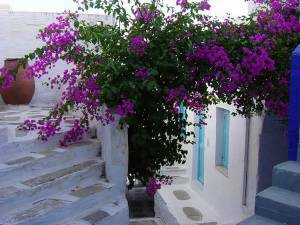 This is one of the many pretty villages of Tinos, and the ride to it along the old paved road from town is truly breathtaking. The village is a fine example of the old fortified style of many mountain villages; it has three fresh springs, one at the entrance, and two at the main square in the center of the village. This village is only for foot traffic or donkeys, is blissfully quiet, and has many side lanes and steps leading to the upper section; the entire village has outstanding traditional architecture and overlooks the lush green valley sweeping down to the sea.